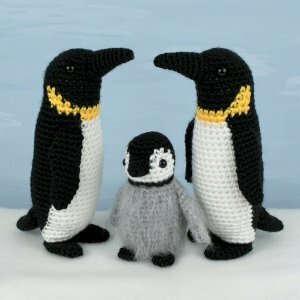 Two original crochet amigurumi patterns (Emperor Penguin and Baby Emperor Penguin) by June Gilbank. Buy both penguin patterns together to create a penguin family and SAVE! Details (Adult): This is a perfect pattern for practising making neat colour changes! The pattern notes include bonus tips to make your colour changes look as good as possible. The pattern is 9 pages long and includes full instructions and 14 detailed step-by-step photographs with explanations so you can crochet and assemble a perfect penguin of your own. Details (Baby): You'll need a wire pet slicker brush to brush out the body and wings after crocheting (instructions are given in pattern). You can also leave them unbrushed to create a smooth baby penguin. Date Added: 09/07/2013 by Sarah M.
Date Added: 01/14/2013 by Monica B. Date Added: 09/06/2012 by Judy C.
Date Added: 01/20/2012 by Linda U.